Received August 5, 2018; Revised September 24, 2018; Accepted October 4, 2018. There are several commercially approved stent grafts in Korea for the treatment of abdominal aortic aneurysms (AAAs). Each device has its advantages and disadvantages based on the patient’s anatomy and the clinical situation. The Zenith device allows accurate and precise endograft placement, whereas the Endurant device has improved flexibility and trackability. We reviewed 5 cases in which a combination of the Zenith main body and the Endurant iliac limb was used. From January 2010 to February 2015, 90 patients with AAA underwent endovascular aneurysm repair (EVAR) using the Zenith body at Daegu Catholic University Hospital. Among them, 5 patients who underwent EVAR with the Zenith body and Endurant iliac limb were included in this study. The mean age of the patients was 74.20±3.35 years. All patients were men. The main reason for use of the Endurant iliac limb was aortoiliac angulation. Type III endoleak, stent migration, and stent kinking were not noted. Comparing 85 patients who received a Zenith endograft with 5 patients who received the hybrid endograft, there were no statistical differences in clinical characteristics, intraoperative details and post procedural complications. The mean admission duration was 19.00±13.60 days, and the mean follow-up duration was 1,018.11±925.34 days. In the hybrid endograft group, there was no mortality during the follow-up duration. Although the material, radial force, diameter, and length of the overlap zone differ between the two devices, EVAR with the hybrid endograft is safe and effective. Endovascular aneurysm repair (EVAR) is the current standard procedure for the treatment of abdominal aortic aneurysms (AAAs), with lower early mortality and morbidity rates than open aneurysm repair . EVAR has accounted for more than half of all AAA repairs performed according to physician preference, owing to its less invasive nature and the low risk of associated procedural problems . Over the years, endografts have improved and new devices have been commercialized. New devices have been improved for firm proximal sealing, accurate deployment, conformability, and optimal fixation [3–5]. Each commercially available device has some special anatomical advantages. The Zenith device (Cook Inc., Bloomington, IN, USA) allows precise endograft placement and a firm suprarenal fixation , whereas the Endurant device (Medtronic Inc., Santa Rosa, CA, USA) delivery system is small and trackable . In special anatomical considerations, the benefits of each different device may be required. To overcome anatomical restrictions, combinations of different devices have been proposed [8–10]. However, such combinations of endografts have not been approved by the Food and Drug Administration and do not accord with the manufacturers’ instructions for use. We prefer to use the Zenith body over other endografts in AAA with a challenging proximal neck because it provides a strong proximal neck fixation with an accurate and controlled deployment. We also prefer to use the Endurant limb in AAA with a complex iliac anatomy because of its trackability, conformability, and flexibility. The purpose of this study was to review the outcome of the combination of these different devices in restricted cases with anatomical challenges, and to determine the usefulness of hybrid endografts and their indications. We sought to examine and compare the rates of complications and type III endoleak between a standard endograft and a hybrid endograft. The study protocol was approved by the Institutional Review Board of Daegu Catholic University Hospital (IRB no. CR-17-11-RES-001-R). This study was exempted from written informed consent due to retrospective analysis based on medical records by Institutional Review Board. EVAR was performed in 107 patients with AAA from January 2010 to February 2015 at Daegu Catholic University Hospital. A total of 90 Zenith devices, 11 Excluder devices (W.L. Gore & Associates Inc., Flagstaff, AZ, USA), and 6 Endurant devices were used. The data of about 90 patients undergoing EVAR with Zenith body were retrospectively collected. The demographic and outcome data of all patients were collected and analyzed. Among them, 5 patients underwent endovascular treatment for AAA using Zenith body combined with Endurant iliac limb because of complex aortic anatomical challenges in the aorta and the iliac limb. We compared the hybrid endograft (Zenith body and Endurant iliac limb) with the standard endograft (Zenith body and Zenith iliac limb) in patients with AAA treated with EVAR. All patients underwent EVAR of AAA under general anesthesia or epidural anesthesia in an operating room equipped with a portable fluoroscopy unit (GE-OEC 9900; GE Healthcare, Salt Lake City, UT, USA). Bilateral cut down of the common or superficial femoral artery was performed in all cases. We used the Endurant iliac limb instead of the Zenith iliac limb in elective patients with AAA with aortoiliac angulation >60° or common iliac artery aneurysm diameter >24 mm. The two different devices had an at least 3-cm overlap to minimize the risk of type III endoleak. After all the devices had been installed, balloon dilation was performed at the junction of the different devices (Coda balloon; Cook Inc.) to prevent type III endoleak. Three-dimensional computed tomographic angiography (3D CTA) using Aquarius, iNtuition Ed ver. 4.4.6 (TeraRecon Inc., Foster City, CA, USA), was conducted to plan EVAR and to check the necessity for Endurant iliac limb and the combination of different devices. A 3D CTA was also performed to review the aortoiliac anatomy, tortuosity of vessels, aortoiliac angulation, and iliac artery diameter. The obtained data were used to determine the optimal approach for a successful catheterization, the size of the stent grafts, and the ideal iliac limb. Follow-up 3D CTA was performed within postoperative 1 week and then at 6 months and every following year to determine the occurrence of endoleak, and to check for fracture, kinking, migration, and the patency of the endograft. Statistical analysis was performed using PASW Statistics ver. 18.0 software (IBM Co., Armonk, NY, USA). Continuous data are presented as mean and standard deviation. Categorical data are reported as count (percentage). The chi-square test was used for the comparison of qualitative variables, and the Mann–Whitney test was used for the comparison of continuous variables. Values of P <0.05 were considered to be statistically significant. The patients’ demographic characteristics and medical history (Table 1) did not significantly differ between the two groups. The mean age of the patients was 73.04±7.92 years in the standard group and 74.02±3.35 years in the hybrid group (P=0.355). The percentage of male patients was 87.1% in the standard group and 100.0% in the hybrid group (P=0.307). A total of 48 patients (56.5%) in the standard group and 4 patients (80.0%) in the hybrid group had hypertension as a comorbidity (P=0.307). In all patients in the hybrid group, we used Zenith body with firm proximal fixation because of a neck angle of >60°. In 4 cases in the hybrid group, Zenith body and Endurant iliac limb were installed when the aortoiliac angle was >60° and the stiff Zenith iliac limb could not be progressed or was expected to be difficult to progress (Fig. 1). In 1 case, the hybrid endograft was used to cover a 26-mm common iliac artery aneurysm using EVAR with the bell-bottom technique (Fig. 2), because the maximum diameter of the Zenith iliac limb is only 24 mm (Table 2). Although there was no statistical significance, immediate endoleak after stent-graft deployment frequently occurred in the hybrid group (40.0% vs. 21.2%, P=0.392). However, type III endoleak was not noted, and type I endoleak could be successfully resolved with additional adjunctive treatments using a balloon or a Palmaz stent. There was no difference in the admission duration between the two groups (13.95 days vs. 13.40 days, P=0.316). The mean follow-up duration was 1,018.11±925.34 days. In the hybrid group, there were no endoleaks other than type I endoleak, and fracture, kinking, migration, and occlusion of the stent graft were not observed. There were no deaths during the follow-up duration (Table 3). With more surgeons becoming familiar with EVAR, the off-label use of hybrid endografts for EVAR has considerably increased. In a challenging proximal neck, the Zenith device has advantages in that it provides a high radial force suprarenal fixation and an accurate deployment system , and the hydrophilic kink-resistant flexor introducer sheath (Cook Inc.) with the Zenith device can be used very effectively. The sheath design combined with the flexible surface facilitates device insertion and tracking while allowing controlled insertion. However, the Zenith iliac limb easily induces thrombosis and has a higher risk of kinking at the level of a severe angle [11,12]. The maximum diameter of the Zenith iliac limb is only 24 mm. On the other hand, the Endurant device provides advantages in extreme iliac artery tortuosity because of the trackability of the delivery system and the conformability of the device . It can also be effective in the treatment of up to 28-mm common iliac artery aneurysms with AAA. The choice of the appropriate endograft device is also an important component of the endovascular treatment of aneurysms with certain adverse morphological characteristics. The creative use of a hybrid endograft can enable patients with a challenging anatomy to undergo EVAR when EVAR with the standard endograft is not feasible. Such combinations of different endografts could be related to more complications and negative outcomes than the standard graft. In our study combining the merits of Zenith body with the advantages of Endurant limb, there were no cases of type III endoleak and graft migration. There have been reports of type III endoleaks resulting from the insertion of a different additional graft or stent to an Ancure endograft (Guidant, Menlo Park, CA, USA) . However, the previous outcomes of the Zenith body and Excluder limb (W.L. Gore & Associates Inc.) also involved no adverse complications, similar to our results . The combinations of different devices have been reported previously; however, they mostly involved first-generation devices. In addition, most of such combinations have been used to treat endoleaks [14,15]. The recent studies that used AFX body (Endologix Inc., Irvine, CA, USA) with Endurant proximal aortic cuff , combined endograft , and the Zenith body with Excluder limb  showed favorable results. When the stiff Zenith limb was unable to track the tortuous aortoiliac angulation or when the 24 mm maximal diameter of the Zenith limb was not able to cover the common iliac artery aneurysm, we used the Endurant limb instead of the Zenith limb. However, this hybrid endograft might have some problems. The 2 devices are made of the same fiber (polyester) but have a different metal composition (stainless steel in Zenith body and nitinol in Endurant limb). Incompatibility between different metals can accelerate the adverse bioincompatibility of adjacent discordant materials and the corrosion rates . A 16-mm-diameter Endurant limb should be connected to a 12-mm-diameter Zenith body, and the recommended overlap intervals between the body and the limb are also different (minimum 22 mm in Zenith and minimum 30 mm in Endurant). The influence of other radial forces due to other metals, the effect of folding at 16–12 mm, and the overlap intervals should be considered. The limitation of this study is related to the length of follow-up. The mean follow-up duration of this study was <6 months. Although there were no complications in the short term, long-term studies are needed to demonstrate safety. Another limitation is the small number of selected cases in which the hybrid endograft was used. The selection criteria cannot be properly established using the results of a single-center study. Although we obtained positive results, our sample size (5 cases) was too small to generalize our findings to all patients undergoing EVAR. The retrospective and single-center design could also be a limitation of this study. The need for EVAR with combined devices may decrease in the future, as low-profile endografts with thinner and flexible limbs as well as more flexible Zenith limbs are already available in other countries. In conclusion, EVAR with a hybrid endograft can treat more difficult anatomical configurations in selected patients without other treatment options. The use of the Zenith main body with Endurant iliac limb in specific challenging AAA anatomies could be an innovative additional option presenting favorable outcomes without negative effects. This work was supported by a National Research Foundation of Korea grant funded by the Korean government (Ministry of Science and ICT) (No. 2017R1C1B5017117). Fig. 1. 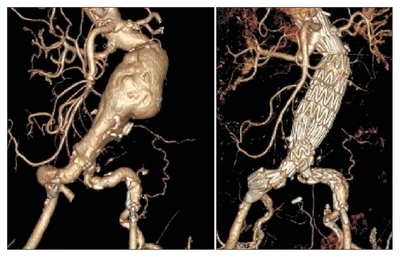 Preoperative and postoperative three-dimensional computed tomographic angiography scans of the abdominal aortic aneurysms treated with endovascular aneurysm repair using a hybrid endograft because of aortoiliac angulation >60°. Fig. 2. 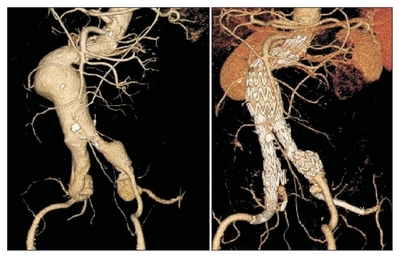 Preoperative and postoperative three-dimensional computed tomographic angiography scans of the abdominal aortic aneurysms treated with endovascular aneurysm repair using a hybrid endograft because of the common iliac artery aneurysm diameter being >24 mm. P<0.05 (Chi-square test, Mann–Whitney test). Schermerhorn ML, O’Malley AJ, Jhaveri A, Cotterill P, Pomposelli F, Landon BE. Endovascular vs. open repair of abdominal aortic aneurysms in the Medicare population. N Engl J Med 2008;358:464-474. Jackson RS, Chang DC, Freischlag JA. Comparison of long-term survival after open vs endovascular repair of intact abdominal aortic aneurysm among Medicare beneficiaries. JAMA 2012;307:1621-1628. Arko FR, Jordan WD Jr, Robaina S, Arko MZ, Fogarty TJ, Makaroun MS, et al. Interdisciplinary and translational innovation: the endurant stent graft…from bedside to benchtop and back to bedside. J Endovasc Ther 2011;18:779-785. Troisi N, Torsello G, Donas KP. Commentary: endurant stent graft: a new-generation device for a new generation of vascular specialist. J Endovasc Ther 2011;18:786-788. D’Elia P, Tyrrell M, Azzaoui R, Sobo-cinski J, Koussa M, Valenti D, et al. Zenith abdominal aortic aneurysm endovascular graft: a literature review. J Cardiovasc Surg (Torino) 2009;50:165-170. Bos WT, Tielliu IF, Zeebregts CJ, Prins TR, van den Dungen JJ, Verhoeven EL. Results of endovascular abdominal aortic aneurysm repair with the Zenith stent-graft. Eur J Vasc Endovasc Surg 2008;36:653-660. Bastos Gonçalves F, de Vries JP, van Keulen JW, Dekker H, Moll FL, van Herwaarden JA, et al. Severe proximal aneurysm neck angulation: early results using the Endurant stentgraft system. Eur J Vasc Endovasc Surg 2011;41:193-200. Bos WT, Tielliu IF, Sondakh AO, Vourliotakis G, Bracale UM, Verhoeven EL. Hybrid endograft solution for complex iliac anatomy: Zenith body and Excluder limbs. Vascular 2010;18:136-140. Saraidaridis JT, Osborne NH, Eliason JL, Criado E, Williams DM, Dasika NL, et al. Composite stent-grafts are not associated with increased endoleak or reintervention rates after endovascular abdominal aneurysm repair. Ann Vasc Surg 2013;27:274-281. Matsagkas MI, Kouvelos G, Spanos K, Athanasoulas A, Giannoukas A. Double fixation for abdominal aortic aneurysm repair using AFX body and Endurant proximal aortic cuff: mid-term results. Interact Cardiovasc Thorac Surg 2017;25:1-5. Carroccio A, Faries PL, Morrissey NJ, Teodorescu V, Burks JA, Gravereaux EC, et al. Predicting iliac limb occlusions after bifurcated aortic stent grafting: anatomic and device-related causes. J Vasc Surg 2002;36:679-684. Baum RA, Shetty SK, Carpenter JP, Soulen MC, Velazquez OC, Shlansky-Goldberg RD, et al. Limb kinking in supported and unsupported abdominal aortic stent-grafts. J Vasc Interv Radiol 2000;11:1165-1171. Brown KE, Heyer KS, Matsumura JS, Eskandari MK. Late type III endoleak and graft failure of an Ancure stent-graft. J Vasc Interv Radiol 2008;19:1506-1508. Wirthlin DJ, Alcocer F, Whitley D, Jordan WD. Use of hybrid aortic stent grafts for endovascular repair of abdominal aortic aneurysms: indications and outcomes. J Surg Res 2002;108:14-19. Jordan WD Jr, Naslund TC, Adelman MA, Simoni G, Wirthlin DJ. Endovascular abdominal aortic aneurysm repair in patients with challenging anatomy: utility of the hybrid endo-graft. Vascular 2004;12:106-113.